HOW DO I KNOW IF I HAVE HAIL OR WIND DAMAGE? We recommend that you look at each side, or “elevation” of your home. While doing that taking notice of any dings, dents or breaks on your siding, doors, fascia or soffit. Bryan our storm damage specialist will come out to your home to do a free property inspection. WHO CAN I CALL IF I THINK I HAVE HAIL OR WIND DAMAGE? 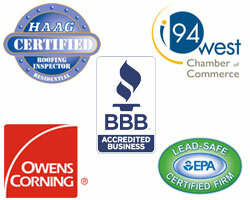 Johnson Exteriors,we specialize in assessing Storm damage. Bryan knows exactly what to look for whendealing with storm damage and will make sure that everything that is damaged will get covered by your insurance company. DO I HAVE TO FILE AN INSURANCE CLAIM? No, as a matter of a fact you do not, especially if the cost of the damages does not exceed your deductible.That’s why it’s very important to have Bryan our storm damage specialist help you decide. If after inspecting your property we have found enough damage that warrants filing a claim, we will be more than happy to help you in doing so. WILL MY INSURANCE COMPANY DO WHAT IS BEST FOR ME? You would like to think so. However, our experience with prior customers has proven otherwise. It is common practice in this industry for insurers to deliberately deny claims. That is why it is extremely important to have a contractor who is very knowledgeable in this industry available to meet the adjuster on your behalf.